The Yale Initiative for the Study of Ancient Pyrotechnology (Y-PYRO) serves as an umbrella organization for archaeological research carried out by Council on Archaeological Studies (CAS) faculty, students, and scholars on five continents. Y-PYRO also oversees the Yale University Archaeology Laboratories (YUALs), an integrated cluster of analytical, dating, and other research facilities. The development of technology can be conceptualized in terms of the control of fire: pyrotechnology. New technologies and materials, until quite recently in human history, depended on attaining and controlling greater and greater temperatures. This process began as early as 1.5 million years ago, when control of fire enabled changes in human behavior, diet, and even technology, such as heat treatment of stone, wood implements, and complex adhesives to join them as compound tools. Baked clay (terracotta) eventually followed, as did ceramics, metals, faience, glass, and other substances on which civilization was built. 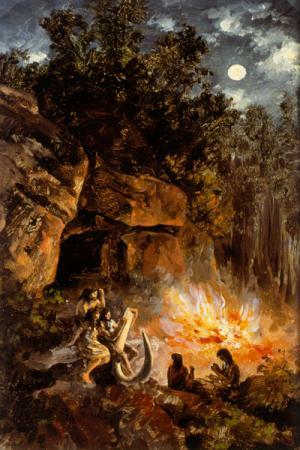 The faculty and students of Yale’s CAS conduct both field- and lab-based studies on how increasingly sophisticated human control of fire, as revealed through investigation of material culture and the archaeological record, became a critical stimulus to the emergence of behavioral, cultural, and societal complexity around the world. In addition, thermally-induced magnetic signals recorded in artifacts and features form the basis for precise dating in Yale’s Archaeomagnetism Lab. Yale and the CAS have a reputation worldwide for innovative research in emerging complex societies, and as such, the CAS identified a critical need for enhanced laboratory capabilities and field training in pyrotechnology as an integrated archaeological science. The study of pyrotechnology unifies the STEM fields (materials science, chemistry, geology, etc.) and anthropological archaeology, producing a scientific perspective that is more than the sum of those parts. Pyrotechnology does not simply lie at the cutting edge of one field. Instead, it lies where the cutting edges of multiple fields meet. Therefore, archaeological science at Yale, including the training of undergraduate and graduate students, is organized around – although not limited to – an overarching theme of pyrotechnology. In turn, Y-PYRO serves to focus and unify many of the diverse research projects of CAS faculty and students. (1) Prometheus. In Greek mythology, Prometheus was a Titan who created humans by crafting them from clay, and he subsequently stole fire from Mount Olympus to give it to humanity. 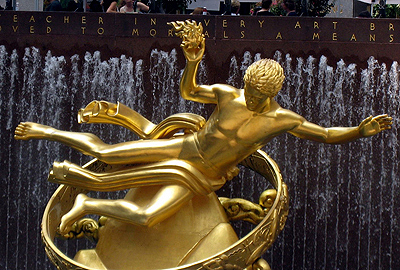 One of the most famous images of Prometheus is Paul Manship’s golden sculpture in Rockefeller Center in New York City. The quote carved into the granite wall behind him is taken from the Greek dramatist Aeschylus in the 6th century BCE: “Prometheus, teacher in every art, brought the fire that hath proved to mortals a means to mighty ends.” A similar figure appears in Georgian mythology. Amirani is a demigod who defiantly introduced humanity to fire and metals, and consequently, like Prometheus, he is chained to a mountain in the Caucasus for eternal punishment. (2) Hand stencils in cave art. 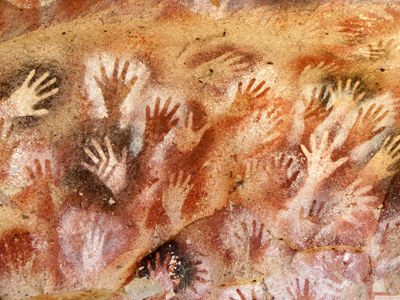 Hand stencils date back as far as 40,000 years and are found in caves around the world. To create such a stencil, a hand was placed against the rock, and a red, white, or black pigment was blown – either through a tube (bone or reed) or sprayed from the mouth – to create a diffuse cloud of color and leave a silhouette of the hand on the rock. Such stencils are common in prehistoric art on all inhabited continents, from southwestern Europe to Australia and the Americas. In fact, the world’s oldest known hand stencil was recently discovered in Indonesia, dating as far back as 38,000 BCE. These hand stencils remind us that individuals produced the material culture that we study today, and they have been explored as a way to identify the women and children who lived in prehistory. 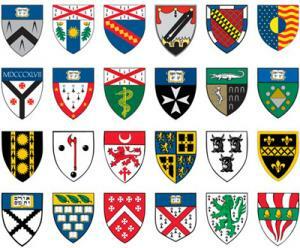 (3) Heraldic shields and imagery. Shields are ubiquitous at Yale. In addition to the university’s own shield, every residential college and school at Yale has one, as do many centers, research groups, interdisciplinary initiatives, and even student clubs and organizations. Most of them also feature “Yale blue” prominently. Combining Prometheus imagery and hand stencils on a shield only made sense! This also has the serendipitous coincidence of putting two common heraldic symbols together on our shield: flames (which serve as a symbol of excitement and zealousness) and a hand (which symbolizes credibility and sincerity).